You are stressed from work and you do not feel good about your body and your mind …. this little massage relaxation weekend and fitness is for you !!! You want to learn to massage and a massage this weekend is for you. Objective of this workshop is to introduce you to a series of simple and easy technics to implement in your daily life to release all the tension and restore well-being and wholeness through tantric massages. This special week end worshop will be also an opportunity to practise the Tantra. Tantric massage primary objective awareness of the body, out of mind control, far from automatic gestures and behaviors quotidien.En being physically present to itself, it allows to be present to another. This is why it can build a true sensual moment for two, without extraneous thoughts. In the Tantric tradition, these movements awaken life forces in man. It is ideal for men who need to circulate their sexual energy and érotiser their relationship. For followers of this philosophy, tantric massage is an experience at once sensual and spiritual. 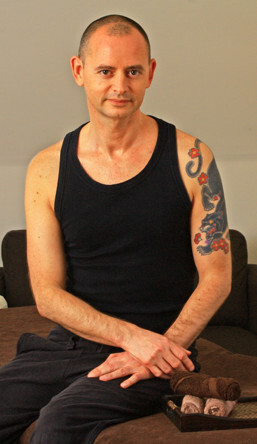 Professional masseur for ten years, Kriss is a graduate of Massage Wellness Practitioner. He trained in South Asia to all massage techniques: Traditional Thai, Thai Oil, Swedish, Californian … .It also practice relaxation therapy, relaxation / meditation and IQ Qong and intervenes today ‘ hui in several companies: massages, relaxation, seminars … It puts you at the center any relationship masseur / massaged the exchange, sharing and listening to others. 23:00 to 24:00: steam room. 2 nights / Breakfast + 4 meals + massage pool hamam + = 380 EUR per person. 50% of the course price will be charged upon booking and 50% one month prior to the course date. We organize over 10 years of massage workshops at the Gay Resort Le Vieux Donjon.